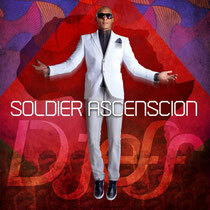 ‘Soldier Ascension’ has been made in Angola, where Djeff is a DJ, producer and TV presenter, but this is not an Angolan album, it’s not defined or confined by national borders, and too 21st century in style and execution to be tarred with the ‘World Music’ brush. ‘Soldier Ascension’ is an album of cosmopolitan tracks that could loosely be described as Afro-house while incorporating elements of so many different musical styles that Djeff has heard and been inspired by growing up in Portugal and Angola, and on his travels as a DJ. From the balladry of ‘One Night’ to the hi-life flavoured hedonism of ‘Mutakala’ and from the Portuguese vocals on ‘Cuza Di Terra’ and ‘Esse Mambo’ to the pounding beats and horns of ‘Celebration’, which was made with the house dancers of New York in mind, ‘Soldier Ascension’ is a fine collection. The son of a Cape-Verdean father and an Angolan mother, Tiago Baros, aka Djeff, was born in 1984 and grew up in Portugal hearing artists such as Michael Jackson, Europe, Michael Bolton, and Bryan Adams alongside his father’s collection of Kassav, Tabanka Jazz, Livity, Grace Evora and Eduardo Paim. But it was when he got into dance music, and especially house, inspired first by his sister’s cassette collection and later by DJs like Erick Morillo, that he began to bring his own diverse musical inspirations together. With this album, his second following the release of ‘Malembe Malembe’ in 2010, Djeff has tried to make something different to what is happening in Angola right now. “In Angola,” he says, “everyone is making Afro-house, but sometimes with too much drums so that it’s only about the beat, not about the melodies or instruments. In Portugal they loved ‘Cuza Di Terra,’ ‘Mutakala,’ Otoipenny,’ ‘Soldier Ascension’ and ‘A Little Bit Closer’. In Angola it is ‘Otoipeny,’ ‘Esse Mambo,’ ‘African Mermaid’ and ‘Soldier Ascension’. Here in the United States people have been enjoying more ‘Celebration,’ ‘African Mermaid’ and ‘Make Me Stronger,’ so it’s always different, which is good. 'Soldier Ascension' is out now on Tribe Records.